Just what is the best electric lawn mower that’s on the market today? In this modern era, gasoline mowers seem to finally be being truly challenged by the wonders of our cutting edge lawn mower batteries. For something simpler, see our top 10 list of string trimmers. Looking for gas-powered? Find your next gas string trimmer here. Perhaps you want to stay electric? Try a battery powered weed eater. The truth is that gasoline is actually pretty great in a lot of ways, especially when it comes to running a dependable lawn mower and it really does have its benefits, but that doesn’t mean that an electric mower isn’t a viable choice as well. There are a lot of benefits to a battery powered grass cutters — just as there are to its more traditional counterpart. If you’re looking for Electric Reel Mowers – click here. View the Best Electric Lawn Mower on the Market, Below. How does an Electric lawn Mower Work? Are Electric lawn Mowers as good as Gas? What’s the Quietest Electric lawn Mower? Are Electric lawn Mowers Quiet? Can the Electric lawn Mowers be Cleaned? 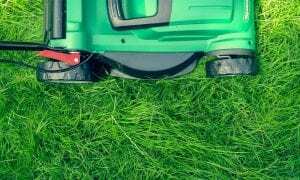 Are Electric lawn Mowers Safe? Good motor for cheap price. But with all the companies and brands vying for a spot in your garage, who do you choose and whose is going to give you the best deal for what you bneed? Well, to take some of the pain out of the buying process for you, we’ve compiled a list and review of the best electric lawn mowers. Got a large lawn? Check out our review on Riding Lawn mowers. Battery powered lawn mower reviews, pros and cons, top picks for value and functionality, you can read about all of these things in our best of reviews below. The Greenworks 25142 is hearty and worthwhile and one of the best electric mowers on the market today. Easy to store and convenient to use, once you get past its small and intuitive learning curve, this product is easily worth your money if you’re shopping around for a product that’s not gas-powered. The fact of the matter is whether you go for a chorded, gasoline power, or electronic, there will be limitations to your specific type of machine. The Ego certainly still bears some of the burdens of all the best battery models, but it's hardy, and it's our premium buying pick for a good reason: it really is a step ahead of most other products on the market. With most electric and gasoline powered lawn mowers costing anywhere from two-hundred to upwards of four-hundred dollars, for the price that it’ll run you, you’ll be hard pressed to find one that has better hardware under its hood than this one. This Sun Joe will give you a lot of use and you can really tell that it was designed with value and practicality in mind. That said, it does have its limitations and you should use it regularly on your grass to avoid having to ask it to tackle too big a job. The three-in-one functionality is an innovative design that’s of a quality that one should expect from a company like Black & Decker. This machine is suitable for small yards and medium-length grass. As a weed eater, it truly earns its keep and value. This mower’s battery pack system probably makes it one of the most easy and convenient to charge and use for long periods of time. Even if you have another for bigger jobs, this one could easily earn its spot in anyone's shed as a touch-up and maintenance tool. Convenient battery packs as power source. This mower looks great and can handle a bit more grass than other products. It also boasts a number of the best mowing options including mulching, bag capture, and rear discharge. Still, it has a limited battery life and its battery’s maintenance might need to be regularly taken into consideration. A little more capable than other mowers. This product can handle small and well-tended lawns with ease. It’s a corded model, so keep that in mind. The 50220 is a bit heavier than other electrics, but much lighter than your average gasoline powered machine. It’s extremely comfortable to push around, though, thanks to the ergonomic design of its handle. All in all, the Earthwise 50220 is a solid grass cutter that should last you for a good many seasons and that’s great for an operator who mows often and keeps up their land. Which is why we chose this item as one of the best on our review list. Can handle most well-tended yards. The Worx WG719 boasts almost unrivaled maneuverability thanks to its innovative front-wheel design. That said, the same wheel design means that one has to adjust both wheels when changing the mower’s deck level; however, this is only a minor hassle that’s more than made up for by the machine’s capability. For a cramped or small lawn, this electric lawn mower is the perfect machine, as it is able to get around corners and angles that other battery and gas products just wouldn’t be able to surmount easily. Superior maneuverability to almost all other models. The Remington RM202A is a comfortable product to operate. It isn’t cordless, but it’s still maneuverable enough for your average user. This product is lightweight and is equipped with a very comfortable and adjustable handle. The only downside of this electric lawn mower is that its deck can only be raised so high. For small and well-kept lawns, this mower will do just fine, but perhaps not the best for more wild yards. Black & Decker has produced a high value and high quality product here. The CM2043C model runs on interchangeable batteries that practically solve the traditional problem of most needing to be recharged during big projects. The edgemax design of this electric mower also allows for precision cutting, without any part of the it bumping or getting caught on objects most of the time. This is more a luxury battery powered cutter, but it’s also a highly polished machine and arguably the best looking aesthetically. Efficient, interchangeable battery powered lawn mower. Edgemax design allows for close cutting in an easy way. The Earthwise 50214 has a smaller deck than almost all gasoline powered, cordless, and even most battery powered cutters. It’s a simple design that’s best suited for smaller yards and suburban areas. That said, it’s easier to store and should last for years upon years as long as it’s properly taken care of. For the price point that this model goes for you’re getting a square deal for a quality and well-rounded product. This is why we chose it as one of the best for our review. Will last for years with proper care. Electric lawns mowers have been around for a good many number of years. There are two types: corded lawn mowers and cordless battery power electric land mowers. A corded lawn mower works by drawing energy from an outlet or extension cord to run its motor. Generally, corded lawn mowers can have a bit more power than battery-powered mowers, but this isn’t a hard and fast rule. The truth is, though, they can certainly be a hassle if you have a large yard; having to drag out large and long extension cords can be a hassle; although, corded models do have the added benefit of never needing a refill or a charge — they can simply go until you get the job done, which is definitely a convenient and nice change up. Despite what you might be thinking, it’s actually really hard to mess up with a corded mower and no you won’t run over the cord — most products are designed in a way as to prevent this, although it is technically possible, even if highly unlikely as long as you’re careful. Corded mowers are probably the simplest design that there’s ever been — you just plug up and go. There are also products out on the market. These products generally run off of a battery of some sort and are rechargeable most of the time. As long as you keep a battery powered lawn mower charged, then it should be a fairly painless experience using one. Cordless mowers are great when they’re working, but can have a short battery life. Unlike with a gas or corded lawn mower, you won’t get a whole day’s worth of work out of a cordless product. Your average battery-powered grass cutters will only run for about thirty to forty minutes before its battery dies. The charge time on these batteries can then vary, but in general, it isn’t too long and you’ll be able to tackle other landscaping work while waiting on your mower to juice back up. Sometimes you can get an extra battery for a cordless lawn mower, which can greatly increase the run time of your machine; although, purchasing a battery can sometimes cost almost as much as purchasing a new electric mower entirely. Unlike a gas mower, which has a few more, an electric mower actually has very few parts under its hood and is a relatively simple machine. They run off an electric motor that is either powered via outlet or battery pack. Connected to this motor is something called a bridge rectifier, which transfers and converts the current of the electricity that fuels your mower into its motor safely. There is oftentimes also a very large resistor connected to your mower’s electric motor. This resistor allows electricity to safely pass around the many parts of the machine and to dissipate after you’ve turned off your product. There is also, of course, a blade under your mower’s deck, which is powered and spun by all the parts that are listed above. All in all, your battery-powered grass cutter is operated by a combination of power and magnetism and some very basic parts that work in tandem. The low part-count is one of the reasons that they are often so much lighter than traditional, gas powered products. Also, because of its simpler design, it should be less prone to failure as long as you treat it right. Minor repairs on an electric motor should also always be relatively affordable unless you find yourself needing to replace a battery or motor — as these two parts take up most of the production cost of creating one in the first place. Which is best to purchase, an electric mower or a gas powered mower? Well, as with all things in life, the answer to this questions it the eternally non-direct answer of “it depends”. When we performed our best of best review, we found that gasoline powered crass cutters are powerful beasts that shred through grass, turf, and foliage with a loud rage of fury. Both corded and battery land mowers, on the other hand, are quiet and peaceful peacekeepers that maintain the beauty of your grass. Which is more powerful? The gas mowers, hands down — there’s really no argument about it. Your typical gasoline powered land mower will have anywhere from 2.4 to 4+ horsepower. Meanwhile, the average, power owner only runs on about 12 amps, which will put out the equivalent of about one horsepower at the most. Of course, there are other benefits to an electric machine. Lawn mowers operate with very few parts under their hood, making them lightweight and easy to repair. Generally, an electric mower will run perfectly fine on only a bridge rectifier, resistor, blade, chassis, and electric motor. From the best of review, the lower power output also means that its frame doesn’t need to be as heavy duty or bulky. This makes mowers perfectly for smaller men or women, the elderly, and the disable, as they are surprisingly light and easy to maneuver. Many times they often even only made up of mostly a plastic frame. Electric mowers are the undisputed kings of mowing tight spaces and getting around stuffier objects, as well. Most gasoline powered lawn mowers run on a four cycle engine. A four cycle engine is actually very similar to a car engine and they require oil and gas just like a cars does. Because of their engine design, gasoline lawn mowers are practically always going to be much, much louder than an electric or battery models. It wouldn’t be uncommon to hear stinks crunching under your machine’s wheels when you’re using an electric mower since they’re so quiet. With a gasoline engine, you’re never going to get that level of serenity and will probably even need to use ear protection to protect yourself. The sheer power and effectiveness of a gasoline lawn mowers also mean that most of these machines require a much heavier and thicker frame. Gasoline mowers can be troublesome to move about and almost impossible for the old, young, or disable to handle or operate. There’s also the matter of the environment and the fumes that a gasoline engine puts off into the atmosphere. As we said a moment ago, the gasoline engine is much like that in a car and just like a car adds greatly to pollution with its exhaust so too does a gas mower. so having an electric mower will be a better option for the environment. While we doubt that you’ll be within the range of a lawn mowers exhaust long enough for it to do any kind damage to your health, some people do indeed report feeling anxious or sickened by the fumes of a gas engine. These models, contrastingly, expel no exhaust whatsoever. These battery powered models can also be best for the environment, but it’s best to remember that the electricity that you’re putting into your machine was likely produced in a way that releases some numbers of pollutants into the atmosphere — although you are undoubtedly preventing the release of the Co2 that a can of gas would have let off with a gas engined mower. You should also consider the matter of reliability when purchasing a mower. Gas engines are complicated and finicky creatures. Unless you’re a bit of a mechanic yourself, a gasoline mower can be quite a headache if it ever decides to have any issues under the hood. It’s not all that uncommon for a gas engine to misfire or develop issues either. Electric engines, on the other hand, are simple and not very prone to disaster. When something does go wrong with a battery or a corded model, it’s also relatively easy to identify any problems on account of their being very few parts under their hoods. 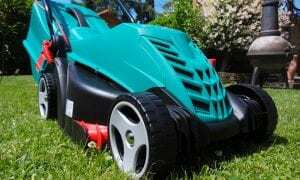 There’s also no need to prime or crank electronic lawn mowers, as most of them start with only the push of a button, unlike a gas motor which needs a good kickstart most of the time. Electric land mowers win when it comes to reliability. What about ease of use, though? Well, electric mowers and their lightweight chassis definitely have a leg up over the heavier and clunkier builds of gasoline mowers. However, these types of lawn mowers have trouble cutting wet or tall grass of any kind. Whereas gasoline powered machines can tear through almost anything. Still, electric mowers are easier to start and keep going. So which is more pleasant to use? This is a draw. We’ve established that gasoline lawn mowers are way more powerful, heavier, louder, and that they produce a greater number of atmospheric conditions. And that electric mowers are quieter, easier to move around, lighter, and weaker than gas mowers. Overall, though, which is the best tool? Because of their power, strength, and rugged toughness, gasoline powered mowers are without a doubt the best for larger jobs and higher grass. They just can’t compete with a gasoline engine when it comes to power or a can-do-attitude. If you own more than an acre of land, then you’re going to want a gasoline engine simply because they have fewer limitations and can work harder and longer than an electric motor. and will save time and electricity and won’t burn out your electric mower. However, if you live in the suburbs or have a smaller yard, then one of these will likely save you money on gas, annoy your neighbors much less with its noise, and will be quicker and easier to push around your yard. Anyone with less than 2/4 of an acre might be best off with going for mains powered or battery lawn mowers. They are quieter than gasoline engines because of their design. They consist of only four major parts and requires no liquid fuel or oil. A gas mower, contrastingly, is powered by what is essentially a smaller version of a car engine. Because of their sheer horsepower and engine design, gas mowers are by their very nature much more loud than electronic ones are. Practically any model that you buy, will be relatively quiet and unobtrusive. You will likely never have to worry about bothering your neighbours when you’re using one. If you want the best and absolute quietest machine, however, then you’re likely best off getting the smallest that you can find. A smaller amperage will reduce a mower’s overall horsepower along with cutting down on any noise pollution that you’d like to eliminate. It wouldn’t be odd for you to be able to hear the sticks crunching under your lawn mower if it’s an mains powered model. The reason that gas mowers are loud is because they run off of a four cylinder engine that is rather similar to a car engine. These gasoline engines have a lot of moving parts to account for and a lot of horsepower, which means that they’re also quite loud at times. Conversely, both corded and battery models operate off of a simple and lower power design. The lack of a large number of mechanical pieces under their hood combined with their lower horsepower causes electric lawn mowers to produce a lot lower amounts of noise than your average gasoline mower. Electric lawn mowers are actually very easy to maintain, whether you have a chord or a battery lawn mower. Unlike with gas mowers, where there are a number of things to keep in mind with maintenance, the care for one is rather straightforward. The main things things that you need to keep up with are their undercarriage, their blades, their batteries if they have them, or their cords. Proper storage can also prevent and further slow down any wear and tear on your machine. With dutiful care you should be able to extend the life for years and years, providing you bought a quality model. To clean the undercarriage, all one has to do is flip the mower on its side. It doesn’t matter which side you la your mower down on, as it doesn’t matter for these models. From there, you should see any grass or muck that has accumulated over your many weeks of cutting. You’ll want to scrape all of this collected filth of off your mower; this step is especially important if you use a model of mower that mulches, as it will keep said feature running smoothly and properly. After you get your deck clean you can stop there; however, if you wanted to prevent rust and greatly extend the life of your mower then you can coat the bottom of your machine with a silicone deck spray. This step is entirely optional and unneeded for mowers with a plastic underside. Now, before moving on to the sharpening of the blade, you’re going to want to take a moment to clean all of the muck and grime off of the blade. Do this thoroughly and really get the blade sparkling, because if you leave any dirt on the blade you might just have some trouble with the final step of maintaining it. A quality wire brush cutter will be the tool that you’ll want to use to actually clean the blade, as it’ll do a lot better job than towels or anything else — everything else will most likely not even really get the deepest layers of caked on debris off of the blade. So, once you get your blade good and clean, you’ll actually be able to move on to sharpening it now. Depending on the model of lawn mower that you’ve purchased, the sharpening strategy may vary. However, you should be able to find a detailed guide in your owner’s manual of how the company recommends that you go about maintaining your product’s blade. Most of the time, you can use a handheld sharpening or a stone sharpener wheel affixed to a drill to touch up and polish up the edges of your mower’s cutting edges. Once you’ve gotten your mower’s blade nice and sharp, the next step that you’ll need to take is to place it upon a balancing tool and see if it sways to any one side. The actual reason that you need to clean a mower blade so thoroughly before sharpening it is actually this step. An unbalanced blade can really lower the life of your mower and any dirt or accumulated gunk can skew the balancing process that you should for after sharpening your product’s blade. If when you balance your blade after sharpening then you’re going to need to remove a bit more metal from whichever side of the blade is heavier. After that, rebalance the blade and see what happens. If the blade is balanced great, if not then continue to remove material until you can get it mostly evenly sharpened. Alright, finally we come to battery maintenance. You only have to worry about this if you have a battery-powered model. Even the best batteries have a shelf life and that’s just a fact. Every Time you use the energy in your battery a chemical reaction is taking place within it. Every Time you charge your battery back up you’re reversing the chemical reaction that occured when you were using it. Over time your battery becomes less and less efficient at reversing this reaction. You can’t really do much about the degradation of your battery that’s caused by charging and its use; however, you can reduce some of the environmental factors. The first thing that you can do is to take your battery indoors whenever you’re not using it. Feel free to leave your electric mower outside, but by bringing its battery pack in you’ll add a decent amount of shelf life to your battery. The heat, dust, and weather can really get to a battery. One day in the heat doesn’t do too much damage to a battery’s lifespan, but three hundred and sixty five can really sap it over a half-decade or so. The next thing that you can do to keep your battery up and kicking for years to come is to charge it back up fully whenever you’re done using it, even if it’s not depleted. And finally, never ever keep your battery charging longer than what’s needed. As we mentioned a moment ago, a battery charges via a chemical reaction that is reversed when it’s plugged up; however, if you keep the reaction going for longer than what’s needed you’ll do damage to the battery’s lifespan. Other than that, it’s always best to remember to keep the frame dry and out of direct sunlight. Rust is another big killer of any and all things metallic. Follow this entry in our buyer’s guide closely and you should get a great return on your investment in any of the models that we listed above. Electric lawn mowers can be just as safe as their gas-guzzling counterparts, as long as you’re smart about their use. Electricity can be a touchy subject with some. Yes, we all know that gas can explode, but most of us have never actually seen a lawn mower or car go up in smoke because of a gas fire. However, the majority of us have been told since we were children to never touch light sockets or anything that might shock, thus we’re naturally a bit apprehensive of anything that has raw electricity coursing through its wires. In this entry of the buyer’s guide, we’ll give you some tips and tricks to not only to ease your mind about the risk of electrocution, but to also protect yourself from the other worries that surround these products. First off, you should know that it’s very unlikely that you would ever be shocked. Any lawn mower sold in a developed country would be regulated to the extent that it would have a grounded construction. Additionally, any outside outlets should have a ground fault circuit interrupter installed within them, which would instantly kick in and stock power flow to a corded mower if there was ever to be any problems. You can also buy extension cords that have their own GFCIs included within themselves. This way you’d never have to worry if the outlets of whatever location that you’re at are up to code and safe. Even if something go terribly wrong and you did get electrocuted, the amperage that’s generated by an electric mower is really only equivalent to that of whatever socket that it’s corded into. Getting shocked by a mower would be like sticking a fork into an outlet. Yes it would hurt quite a bit, but it wouldn’t be fatal to anyone who’s of an average weight and who is in good health. Really, there’s no real danger of electrocution present with one of these products. Even if your grass is wet, it would likely never shock you because of it; although, it wouldn’t likely be able to handle the strain of too much wet grass anyway and would most likely stall out. The real hazards that you should learn to cope with when it comes to an electric mower are very similar to those that you’d also see with a traditional, gasoline powered rig. When using any lawn mower it’s important to make sure that your yard is clear of anything that might be likely to cause problems if it makes contact with your machine’s blade. Rocks, children’s toys, and large sticks, should all be cleared from your yard prior to mowing. Of course, we all know that there will likely still be the occasional object that will escape our attentions. So, it’s best to wear long pants and a pair of sturdy, rubber soled shoes to protect your legs from any debris that your machine produces. Clear and see-through eye protection might also be a good idea. Luckily, you don’t generally have to worry about ear protection as they are extremely quiet in comparison to gas engine mowers. Other than wearing safety gear and effectively thick covering, you should always best to remember to mow only when sober, during the daytime, and to only let those above the age of 18 mow. With corded mowers, especially, make sure to push your mower and not to pull it. You not only run the risk of damaging your own feet very severely by pulling your mower, but you also need to account for your mower’s cord. By mowing in a grid, you’ll avoid the need to pull your machine backwards and thus avoid damage to yourself or your mower. If you follow these tips, and as long as you keep your machine maintained and in good shape, then you should be fine and safe while you work on your yard. You always have the option to go for a gasoline powered lawn mower (see our full guide on them here). The Greenworks 25142 is our top pick. Affordable, quality, and easily storeable, it’s very hard to go wrong with this mower. Also consider the fact that this product is not only effective but also attractive to look at and you’ll know why we chose it. Quick to charge, top of the line construction, and an intuitive design, the Ego Power is number two on our list and also our pick for our best premium price machine. This will cost you a bit more that the others tools on this list, but it’s certainly worth it. Which is why we reviewed this model as the best for premium choice. Rudimentary, basic, and rugged describes the Sun Joe MJ401E. That said, it’s also quite affordable and it gets the job done. You will not find a cheaper mower than this, that has the quality that this one does, anywhere – not at retail prices, anyway. If you’re on a budget and you need a mower for a small yard, then this Sun Joe is for you and that is why we reviewed it as the best value out of our list. We hope you enjoyed our article on "The 10 Best Electric Lawn Mowers for the Money", if so, please share and rate it. In the end i went for the EGO Power+ Lawn Mower, because it had one of the largest deck size’s out of the 10 and also being cordless, so didn’t have to spend more money on an extension lead. so thanks for creating this review!